This year we were lucky enough to gain two new friends in kindergarten! 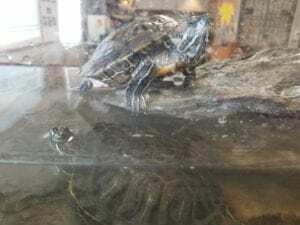 We have two turtles, which we named Steve and “The Little Guy”. This is our first year with a class pet and we are learning how to take care of them responsibly. You might not think that turtles are social, but when you come near the tank Steve will come over to greet you. He also loves to climb onto his rock to watch us while we are reading a story, doing the calendar, or learning a new math topic! “The Little Guy” is shy, but he gets excited when we feed him.